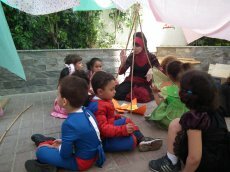 Oasis International School, Cairo – next steps for Kindergarten. 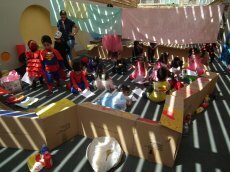 Following on from a successful 3 day training programme earlier in the year, the Kindergarten staff at Oasis International School in Cairo were keen to involve their children in the school’s Adventure Learning Week. Circumstances meant they were not able to take the children off-site, meaning the school needed an on-site outdoor adventure. 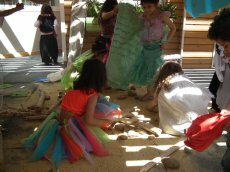 Anita worked with the Kindergarten staff to develop their ideas around a central theme of adventure in the school grounds, whilst considering how they could support a range of curriculum areas. 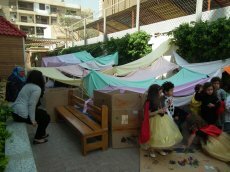 The result – a Kindergarten Camp, with each class working together with a range of materials to create their own shelter. Separate areas were identified for each year group, meaning the classes could build their shelters near each other to create a year camp. 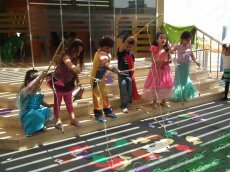 As the Oasis school develops it’s outdoor and adventure learning curriculum, smaller steps to adventure, like these made by the Kindergarten teachers and children, start them on an adventurous journey through their education. Such experiences provide young children with a firm foundation on which the school can build through subsequent years. The camp had its own campfire to sing songs around. The children enjoyed getting their hands on some natural materials. In keeping with the camp theme the children went fishing, but in this case for English and Arabic letters.